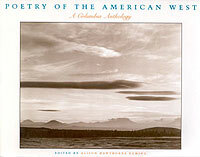 The imagery of the American West is chronicled over the course of its long and varied cultural heritage. Alison Hawthorne Deming has selected 150 poems by 75 poets including protest poems of the Chicano farmworkers, campfire cowboy songs, sacred American Indian songs, and works by Willa Cather, Langston Hughes, Adrienne Rich, Walt Whitman, and other canonical figures. This landmark anthology samples work from the panoply of poetic voices that spring from, or find a home in, the American West. . . Startling and poignant. . . Insightful biographical notes do much to place the work in a larger literary and social context; historical and contemporary photographs of the people and landscapes of the West make it an exceptionally handsome book. [A] testament to the West’s powerful magnetism and survival.